This is the eighth in a series of videos culled from an interview about content marketing I did with Terry Foster of Cision Canada. Cision (the USA version) is also a sponsor of Convince & Convert and our Social Pros podcast. (here’s a post I wrote about their nifty content amplification tool). For more of this series (and others) please subscribe to my YouTube channel. Terry: For the novice content creationist, what are some tips for really compelling headlines? Because that’s all you have to you start with, right? Jay: Tell you what, it’s funny you say that. So often, it really is a headline contest. There’s something to the buzzfeed-ization of thought, because it’s not like print or radio or television or some of the other legacy media where you actually have the opportunity to take in the lede or the first two or three paragraphs, especially in a social-enabled world. You see the headline, and you’ve got to decide right then whether you’re going to proceed or not. So a few tips. One, keep it short. I think that’s pretty self- evident. Second is to be thinking about words that are unexpected. I try and do this a lot in my own work. A thesaurus is really a great friend in the content marketing world. Use words that people don’t see all the time, and that can help you break through the clutter. Third is to try to frame headlines around reader benefits. Talk to the reader instead of talking to the world. Make it a little bit more personal and forthright, and that certainly can be effective as well. Terry: Do you think that social and content are a strategy that are intertwined? Or is social just an amplification tool for content? Jay: Well, increasingly so in that social can also be a source of content. We’re seeing this more and more, where people are taking user- generated content from social media, repackaging it, reconstituting it, atomizing it, and turning it into a longer form or more produced content executions. I think it’s a really interesting kind of push-pull right now between those two types of marketing. I think we might get to the point where we don’t think of social marketing and content marketing as separate entities, we just think of them as marketing. But today, I see social as often an amplification opportunity for great content, yes. 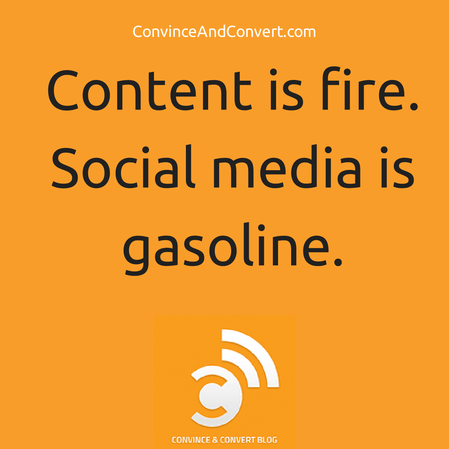 Content is fire, social media is gasoline.